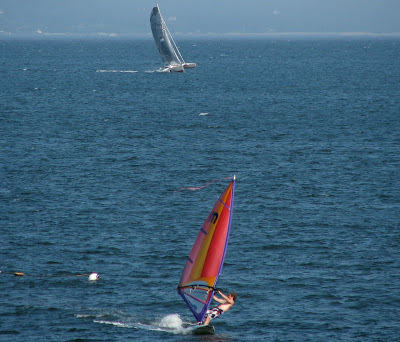 All kinds of sailing and marine photos -- from windsurfing to tall ships, from daysailing to circumnavigating, to waterfront and travel shots. 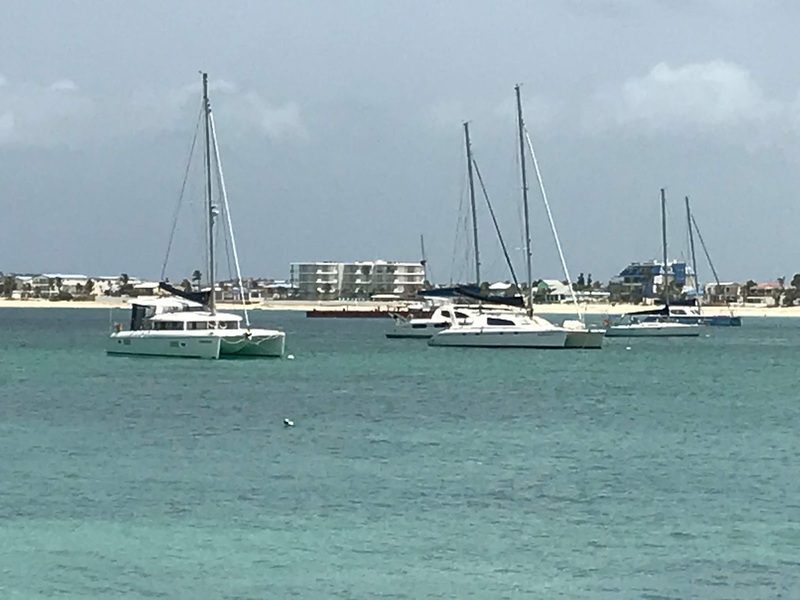 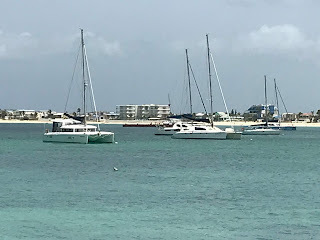 St Maarten is recovering after hurricane Irma -- St Barths is in excellent shape, but St Maarten/St Martin is getting there. 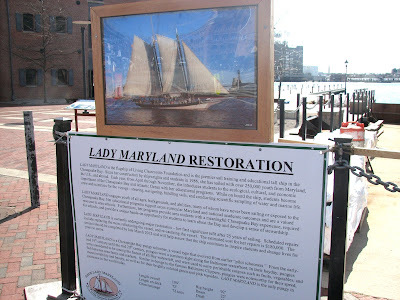 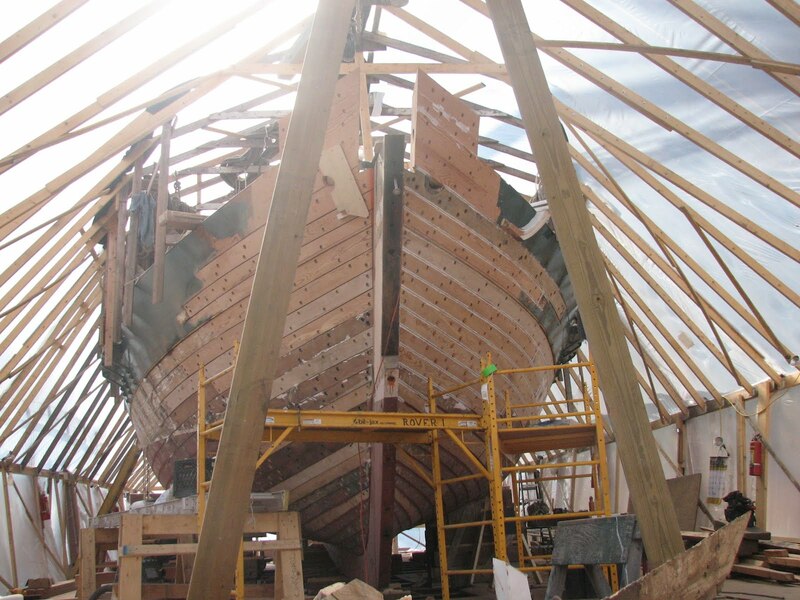 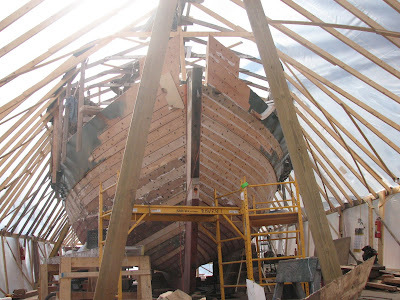 Back in February, we visited Baltimore's Fells Point area and came upon the Lady Maryland being restored on the waterfront. 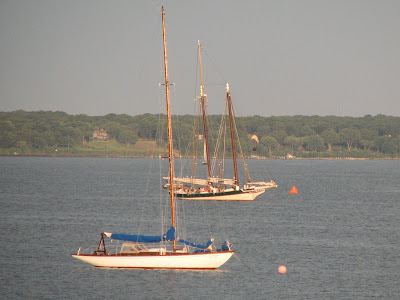 Staysail schooner Fortune in the Wickford race. Here are two of the boats racing in a classic boat regatta off Wickford in mid-October. 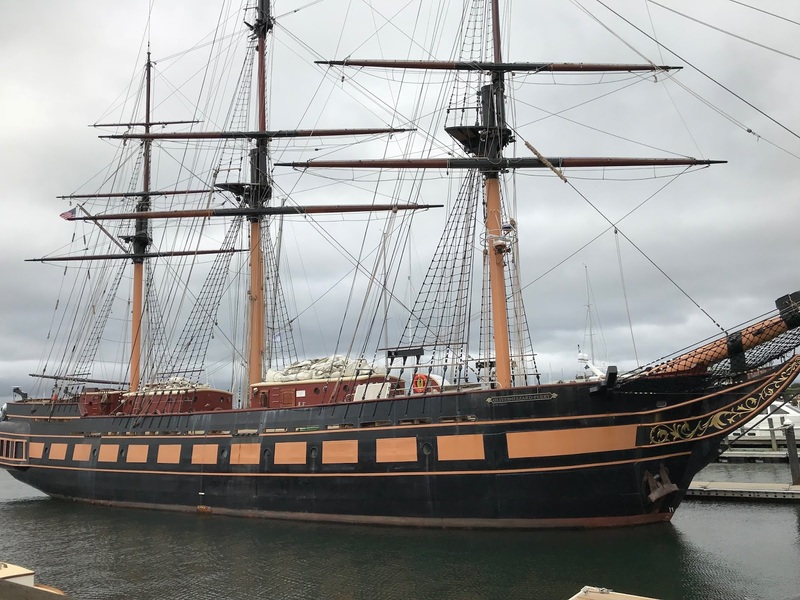 A few weeks later, a barge and crane came by and salvaged Kalispera from her rocky berth near Wickford harbor and took her away; another boat had been rescued earlier and can be seen on the barge. We evacuated inland as Hurricane Irene approached and returned the next day to find the unfortunate Kalispera on the rocks. 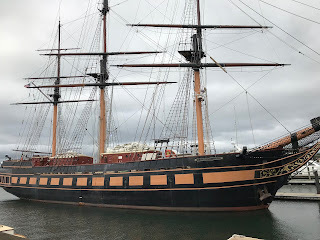 She didn't look too bad until we realized that her starboard side had a number of holes from her time crashing on the rocks. An Ensign heads back into Wickford harbor after the races. 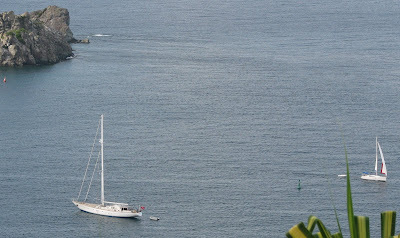 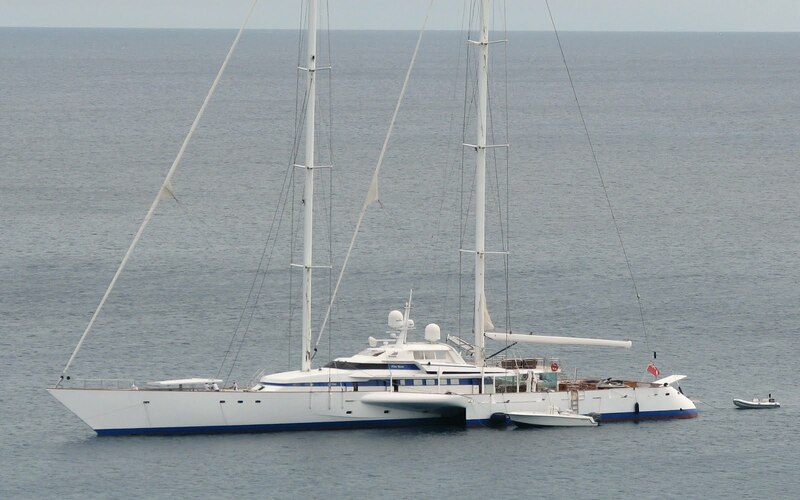 Quite an unusual yacht anchored off Gustavia on St. Barts. 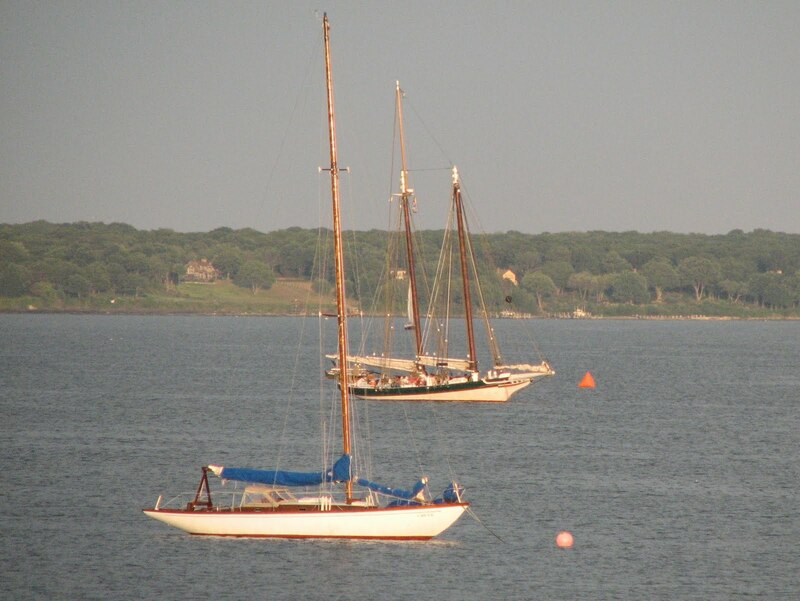 Local 8-meter King Haakon (front) and visiting school ship Lady Maryland (back) on Narragansett Bay in August. 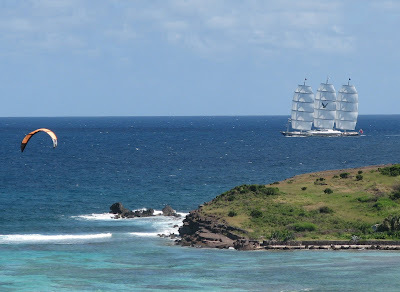 The Lady Maryland is a pungy schooner built in 1986 in Baltimore -- her sparred length is 104 feet. 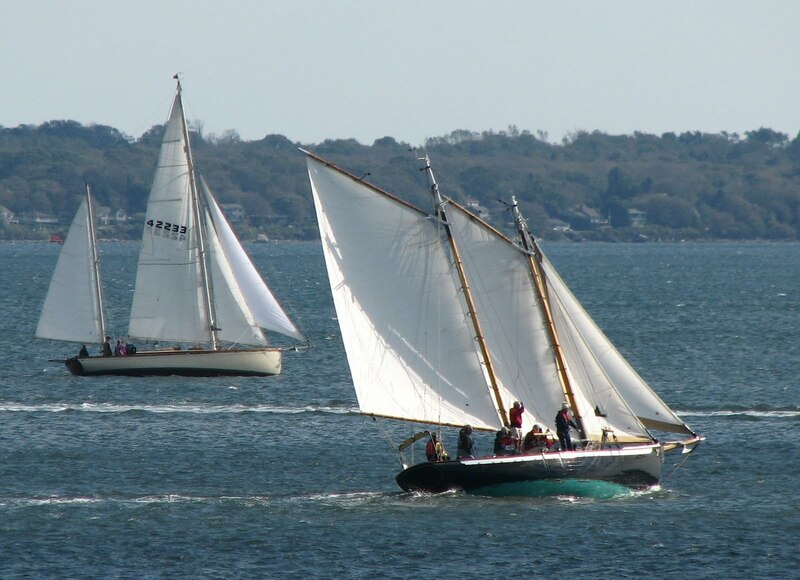 She provides students "the opportunity to experience sailing a historic vessel, while studying history, sailing, seamanship, marine science and ecology on her traditional waters from Maryland to Maine." Link here to learn more about the Lady Maryland and her programs. 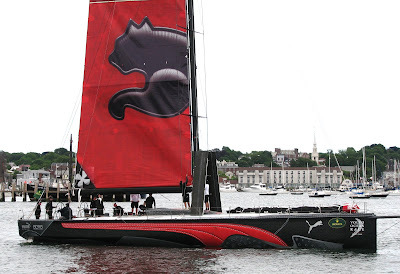 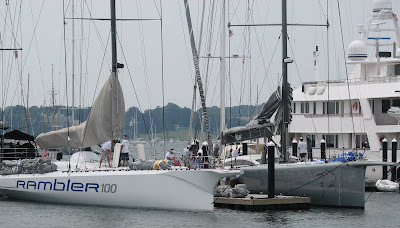 This was the final start in the 2011 Transatlantic Race from Newport to the Lizard in England -- other starts were up to a week earlier. 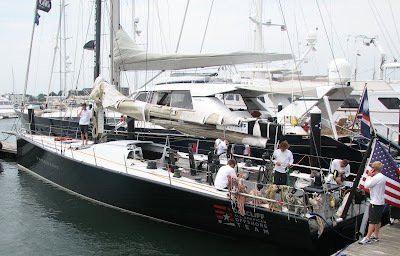 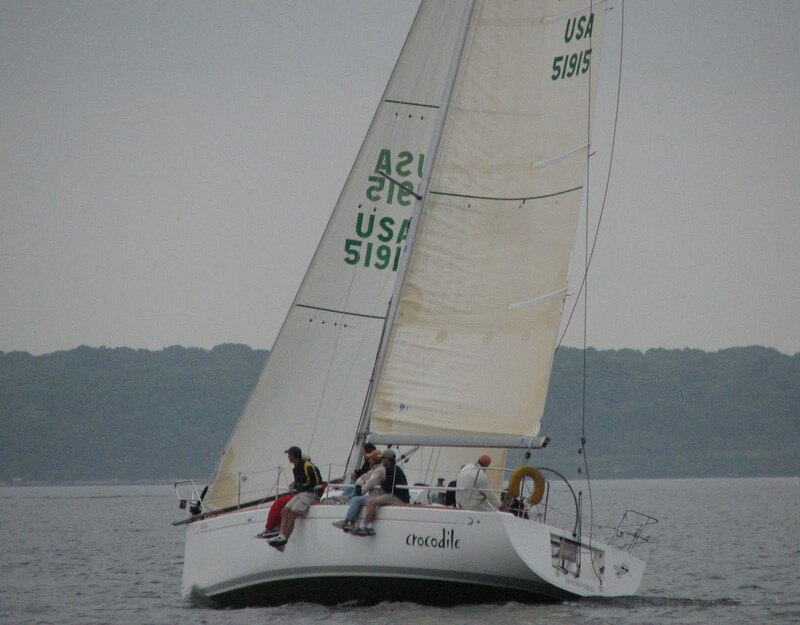 Top photo is the Oakcliff All-American Offshore team entry Vanquish with its crew with an average age of under 24 years. The second photo shows Rambler 100 and ICAP Leopard (100) at the dock -- both shots were a few hours before the start. 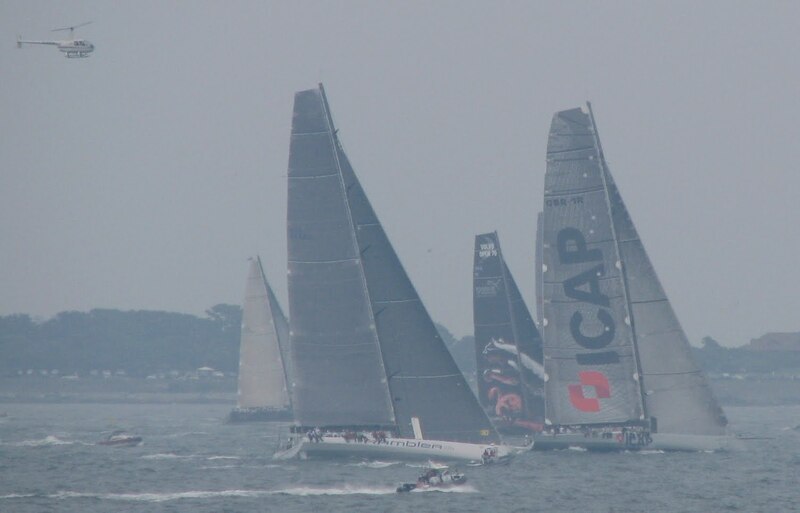 The last photo is about 5-6 minutes after the start and, from left to right, you have Vanquish, Rambler, PUMA Mar Mostro and ICAP Leopard. More than 2700 nautical miles to the finish. 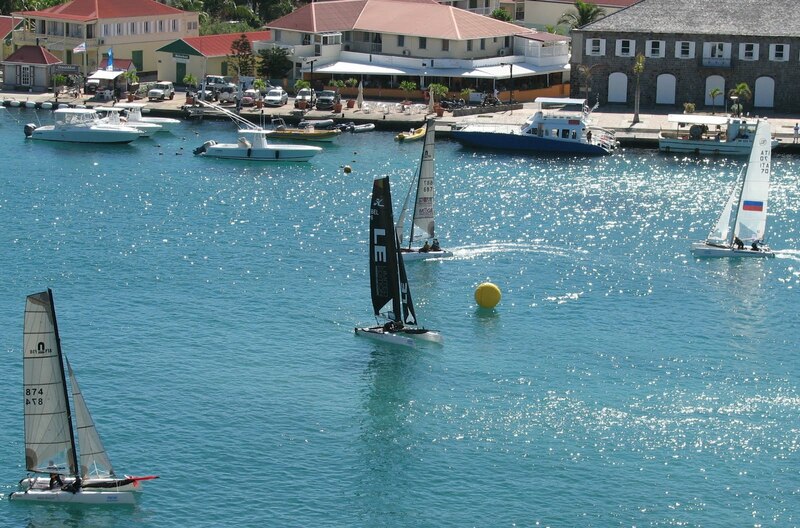 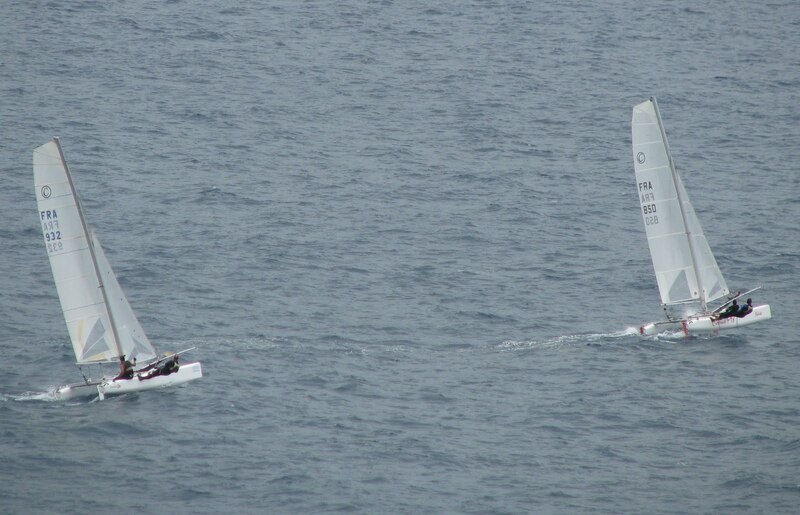 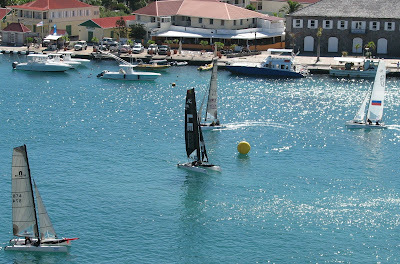 More cats racing off St Barts in the French West Indies. 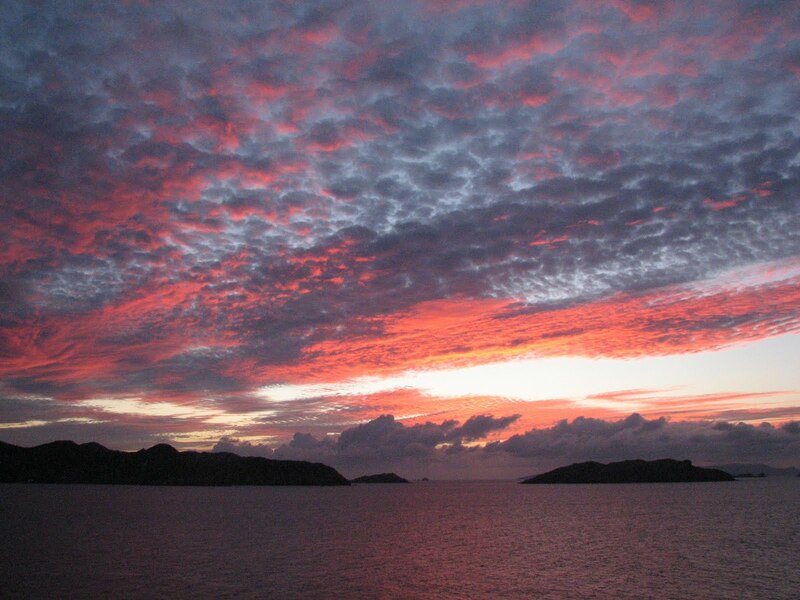 A beautiful sunset from villa BEN on Pointe Milou on St Barts. 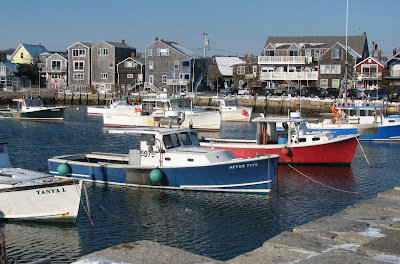 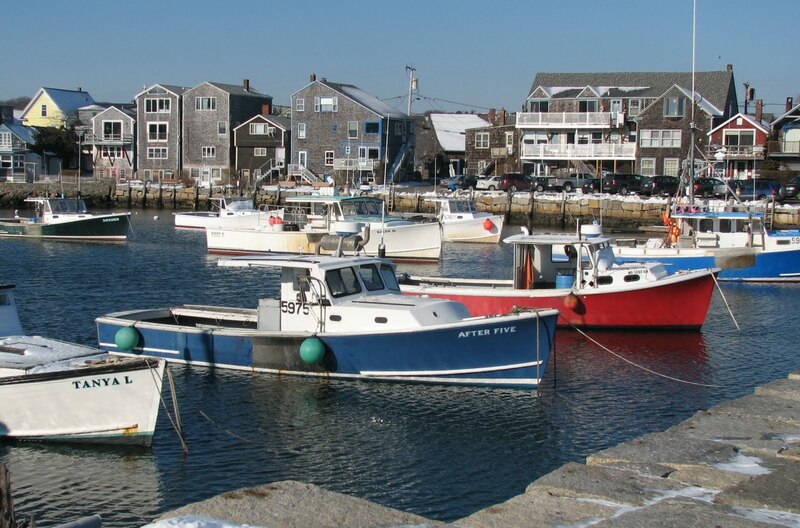 Beautiful winter day in Rockport (Mass) inner harbor -- the lobster vessels in this area operate year 'round and are protected quite well from winter nor'easters. 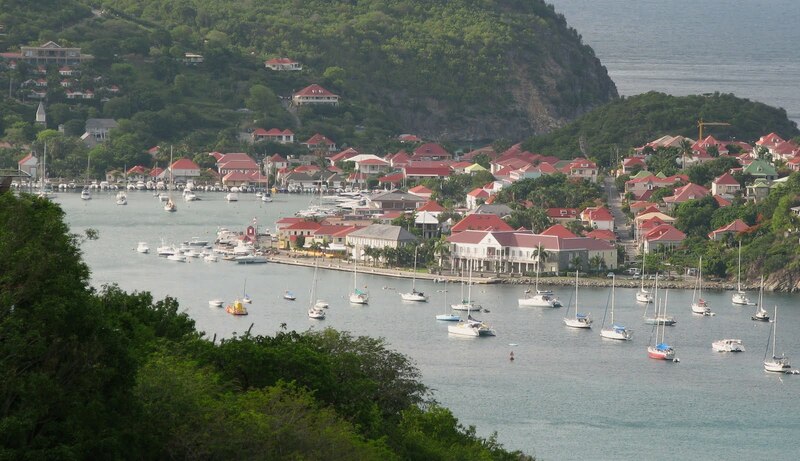 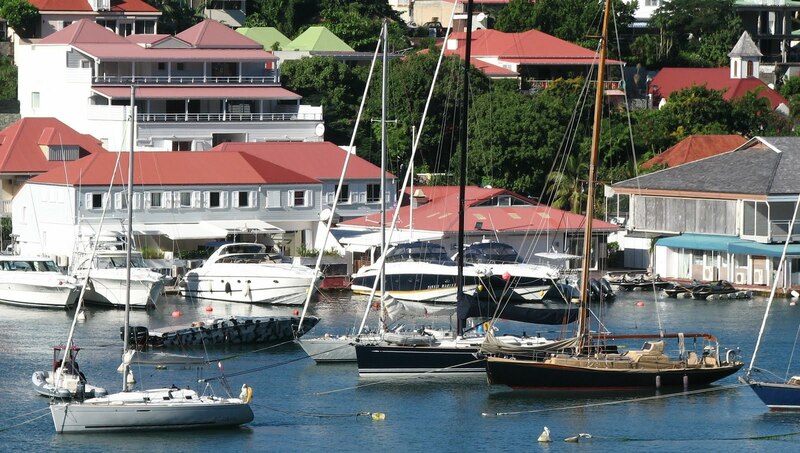 Boats at anchor in Gustavia Harbor on St Barts. 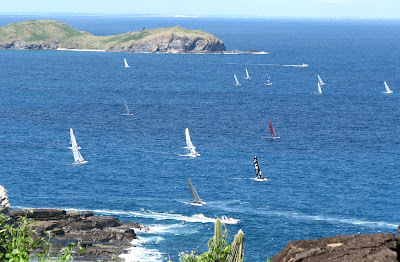 One of the tougher parts of the Round the Island Race at the CataCup was the turning mark tucked up into Gustavia Harbor with its squirrely winds and dead spots. Here are two shots from the 2010 CataCup on St Barts in November -- the large island in the background in the top shot is St Martin and the low island in the distant background in the bottom photo is Anguilla. 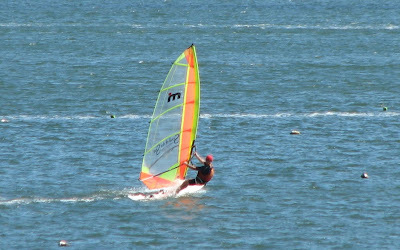 Click the photos to enlarge. 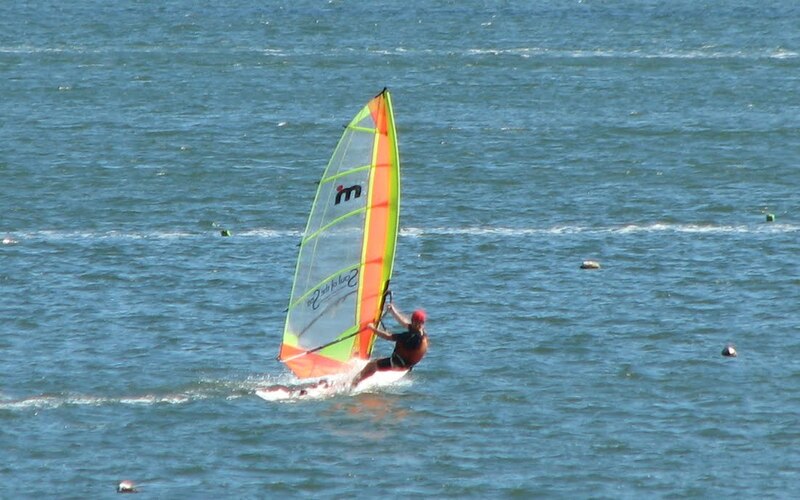 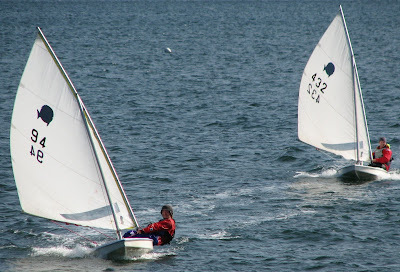 Here are the boys sailing the Sunfish back home at the end of another season at SYC on Narragansett Bay. 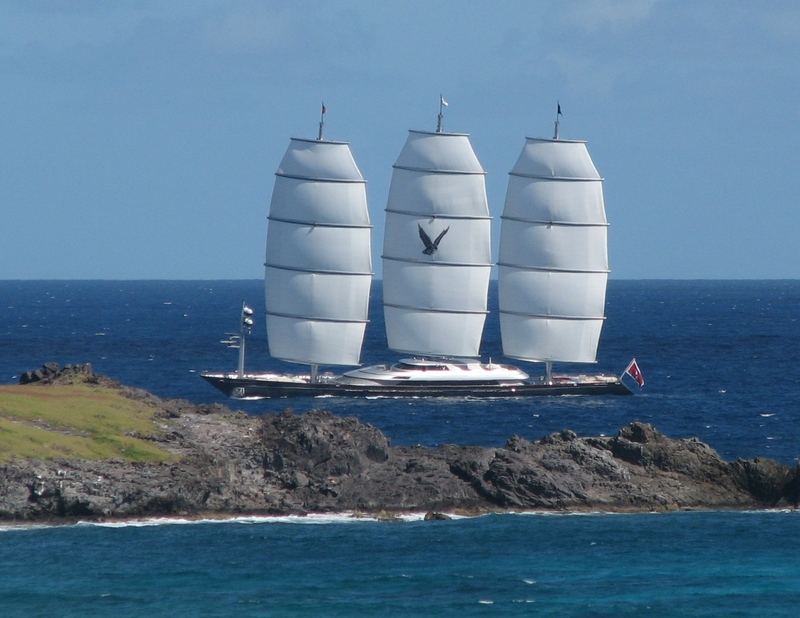 A close-up of the Maltese Falcon on her way to Gustavia. 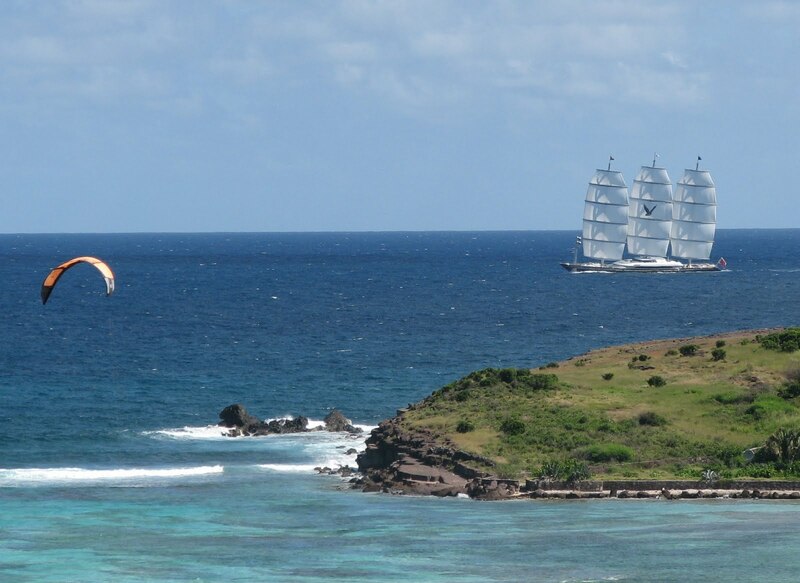 Megayacht 'Maltese Falcon' sails past Grand Cul de Sac on St. Barts in November. 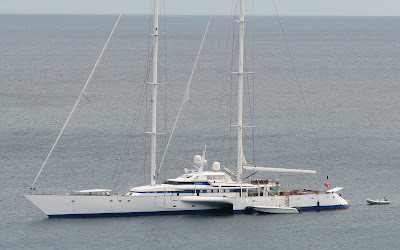 She's 289 feet long and has a beam of 42 feet. 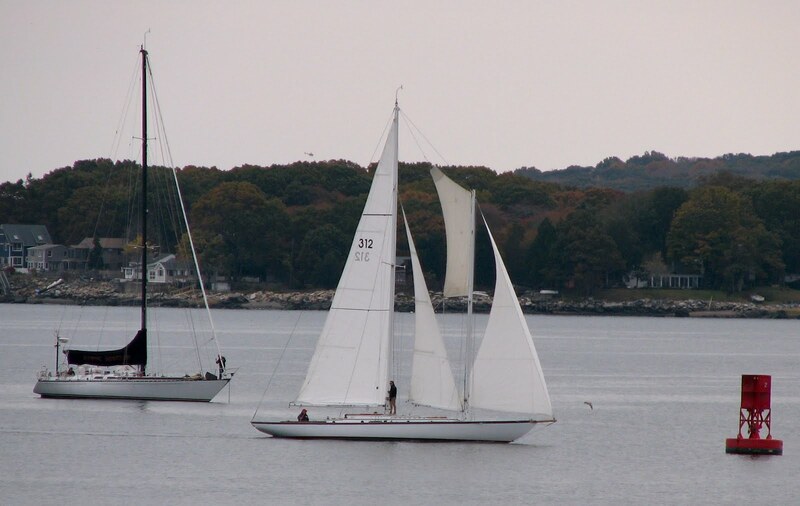 An unusual schooner crosses the line near Wickford harbor in a late October classic boat race on Narragansett Bay. Coach and sailor extraordinaire Skip Whyte out for a fall Sunday session on Narragansett Bay. 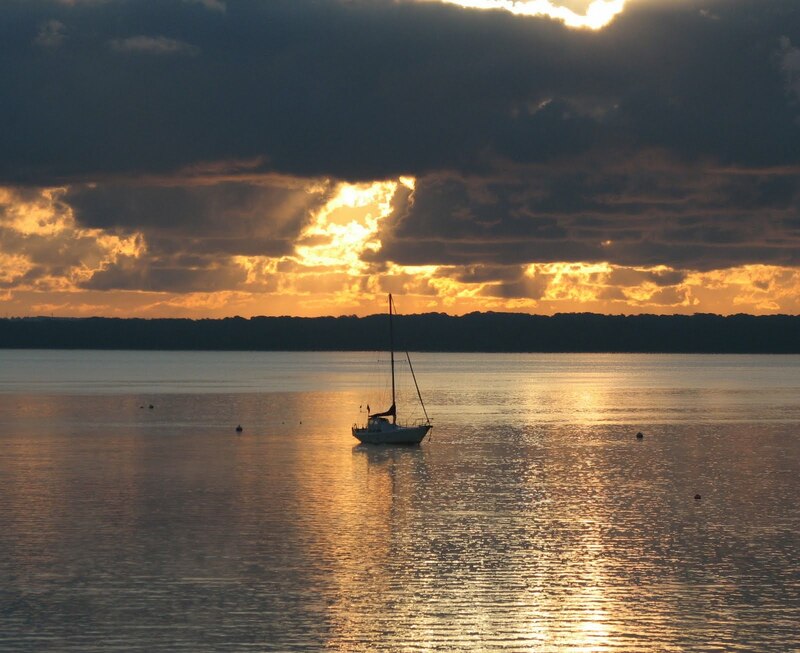 Interesting sunrise on the bay. 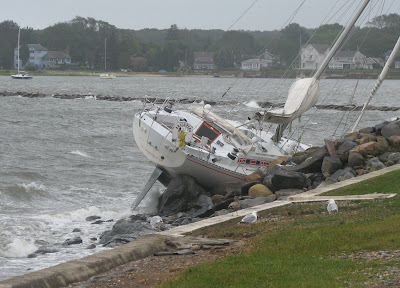 Most of the boats in the mooring field just outside Wickford Harbor have either been hauled for the winter or have moved inside the breakwater. 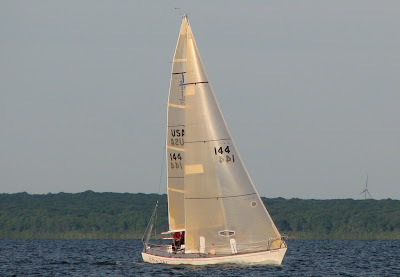 J-29 'Big Taz' racing in the Wickford Wednesday night series. Sloop Crocodile racing in the Wickford Yacht Club Wednesday evening series on Narragansett Bay. 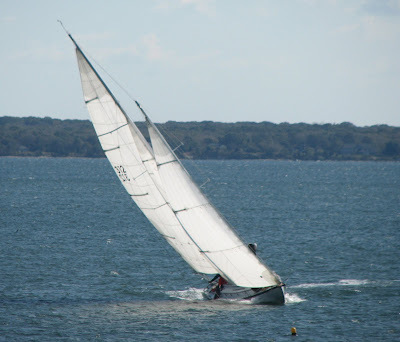 Unusual angle with a Corsair 27(?) Trimaran in the background and a Mistral Equipe in the foreground, one above the other, sailing fast on Narragansett Bay. Here's a closer shot of the Formidable which sails out of Rockport, Mass. 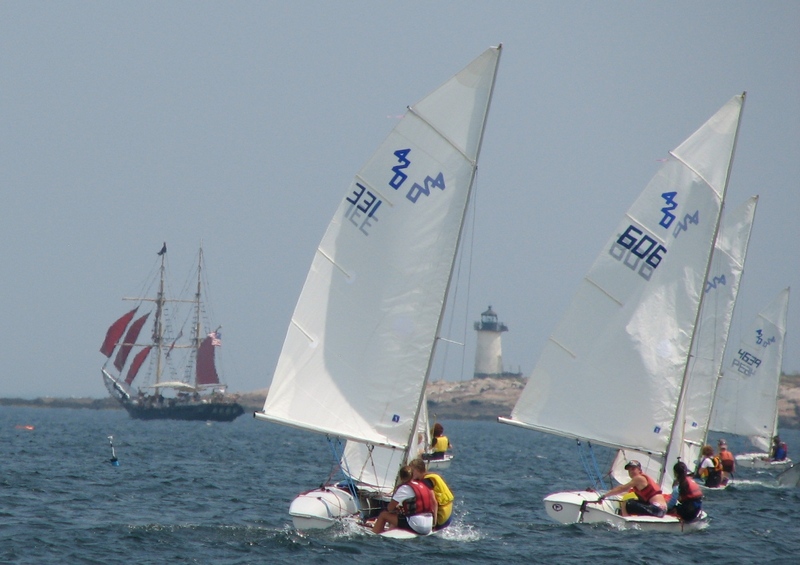 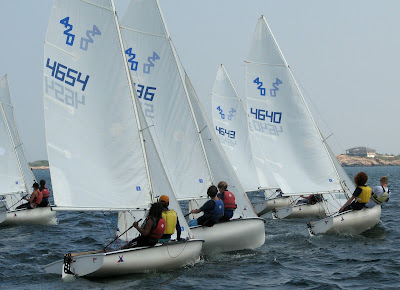 Here are a few shots from the Tim Baker Memorial Junior Regatta sailed in 420s in Rockport MA on Aug. 4. The top photo shows the fleet between races with Straitsmouth lighthouse and the Brigantine 'Formidable' in the background. 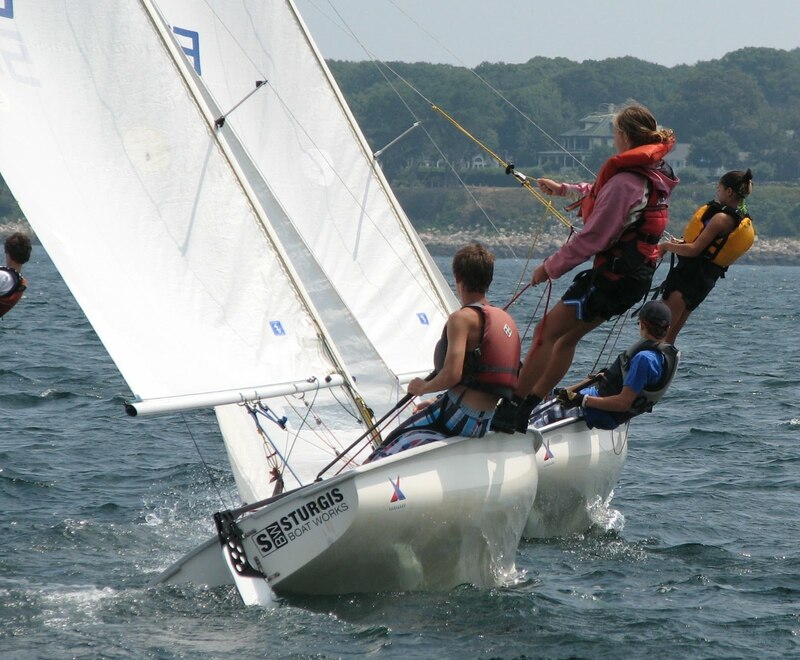 The second shows the racers with their trapezes (the lead trapeze artist is Shelby Salas, Tim Baker's niece). 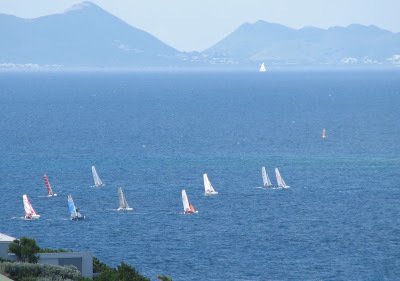 The last shot is the fleet just after a race start. Views of charter yachts and Gustavia from villa KAN on St. Barts in the French West Indies. The Volvo Ocean Racer 'Il Mostro' crew prepares to drop the main after a day race in Newport in June. 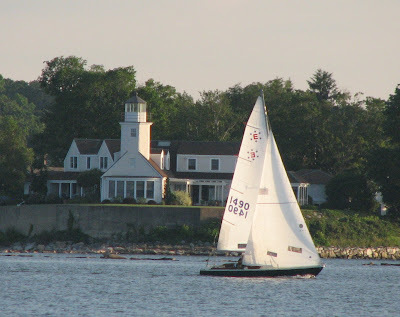 I took this shot during my daughter's wedding rehearsal on the dock on Goat Island.